Located in Hanover, Germany the Royal Herrenhausen Gardens have long been recognized as one of the most beautiful parks in all of Europe. The Herrenhausen Palace was once the summer residence of the Royal House of Hanover. During the raging battles of World War II, the beautiful Herrenhausen Palace was sadly destroyed. The Royal Herrenhausen Gardens include three different areas. Each area represents a unique style. Grossergarten is the largest of the three gardens and construction began way back in 1666. It has a French Baroque style and is the largest Baroque garden in Germany. Martin Charbonnier was a French designer and appointed to design the garden by Electress Sophia of Hannover. The second largest garden is Georgengarten. This garden has a romantic, English style. You’ll find the nearby University of Hannover partially on its grounds. The smallest of the three Royal Herrenhausen Gardens is named Berggarten. It also has a traditional English garden style, similar to Georgengarten. The 6th Award Ceremony of the European Garden Award was held in Hamburg, Germany in September. The event is sponsored by the European Garden Heritage Network (EGHN) as well as the Schloss Dyck Foundation. Eight parks and gardens were recognized in four different categories. Six European countries were represented in the eight awards. They are Germany, France, Sweden, Portugal, Italy and the UK. The European Gardenprize 2015 was awarded to the Herrenhausen Gardens in the “Best Development of a Historical Park or Garden” category. The European Garden Award appreciated the cultivated garden art along with the restored castle of the Royal Herrenhausen Gardens. Another German park won the “Special Award of the Schloss Dyck Foundation”. Hermannshof in Weinheim is public trial and show garden that’s a privately owned. The organization gave Hermannshof the award based on its innovative and internationally respected, planting concepts. You can read about all of the award winners at the European Garden Award web site. If you love beautiful gardens, be sure to visit Europe and see them firsthand. 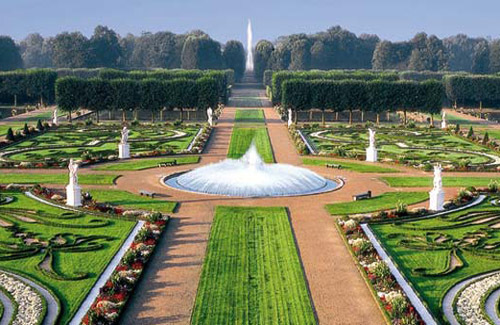 To view the Royal Herrenhausen Gardens in Hanover, Germany please contact us. We can help you plan and book your travel itinerary. Return again to read our luxury blog for other luxury travel ideas and top destinations.